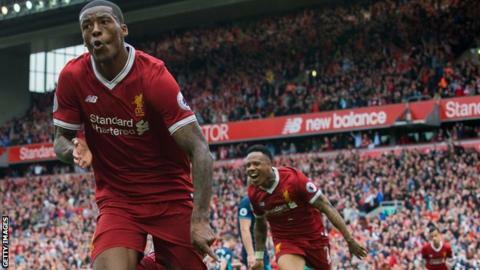 Liverpool secured their Champions League return as their initial nerves turned to jubilation and relegated Middlesbrough crumbled at Anfield. With top-four rivals Arsenal ahead at Everton, Liverpool were impotent in attack and twitchy at the back for most of the first half. But Georginio Wijnaldum eased the tension in injury time, bursting into the box and smashing in a fierce shot at the near post. Philippe Coutinho's low curling free-kick six minutes into the second half was quickly followed by Adam Lallana slotting in to give the Reds a comfortable cushion to ride out to full-time. With Manchester City thrashing Watford, Liverpool finished fourth in the final Premier League table and will have to negotiate Champions League qualifying at the start of next season. Manager Jurgen Klopp had a beaming smile on the final whistle as he congratulated his players, but his team's display - in front of a watching owner John W Henry - underlined the need for further investment as they prepare to step up to Europe's top table for the first time since 2014-15. That campaign ended in the group stages as Brendan Rodgers' side - with talisman Luis Suarez sold to Barcelona - were found wanting. If they play like they did in Sunday's first half, the same fate will be the best this version can hope for. As so often this season, Liverpool's attackers seemed stumped by deep-lying opposition and the soft centre of their defence was nearly exposed when Patrick Bamford got the wrong side of Dejan Lovren and had a strong claim for a penalty denied. But Wijnaldum's powerful opener changed the mood both in the stands and on the pitch. The interplay between Roberto Firmino, Coutinho and Lallana in the second half was close to the scintillating best that they have produced in this campaign. They surely need additions to recreate that form more consistently and on bigger stages next season, but Klopp's side collected an impressive 76 points and finished above Arsenal and Manchester United in his first full season in charge. "I think it does qualify as a successful season. They set out to reach the Champions League and from a league point of view they've achieved that. They'll be bigger and better next season," Match of the Day pundit Alan Shearer said. Daniel Sturridge is the last remaining part of the attacking trio that drove Liverpool close to the Premier League title two seasons ago. But after an injury-blighted couple of campaigns and doubts over whether he can find a place in Klopp's high-tempo gameplan, it had been suggested he might follow Suarez and Raheem Sterling out of the club. Starting successive Premier League games for the first time since September, he added an extra dimension to Liverpool's play with clever movement, a constant penalty-box presence and ability to get a shot away. He came closer than any Liverpool player to scoring in the first 45 minutes with a shot just wide, applauded the fans as he headed off with eight to go and exchanged an embrace with Klopp on his way to the bench. "There is nothing to discuss really," he told Sky Sports, when asked after the match if he would still be at Liverpool next season. "I have two years left on my deal and I am happy here." While Liverpool prepare for the Champions League, Middlesbrough have the different challenge of life in the Championship next season. Chairman Steve Gibson has been bullish about the possibility of an immediate return, saying earlier in the week that he aimed to "smash the league" and return as champions. A starting selection without likely summer departures Alvaro Negredo, Marten de Roon and Adama Traore suggested that caretaker Steve Agnew is already concentrating on the next campaign. Solidly run off the pitch as well as resolute on it, Boro are well set to back up their chairman's promise, particularly if Gibson can convince his centre-back nephew Ben to stick with the club in the second tier. Liverpool's go-to man for inspiration and invention had 132 touches and five shots, with three on target. No team-mate managed more in any of those statistics. Liverpool manager Jurgen Klopp: "We worked hard to get the first goal. We got more confident. We then scored from the free-kick and got even more confident. "The boys then played some fantastic football. I'm really looking forward to next season. I think we have created a wonderful base. The better you're organised, the more you feel free to do special things in offence. "I'm really happy about this - what a wonderful day." Middlesbrough caretaker boss Steve Agnew: "Liverpool have some top-class players and you wait for moments like that Patrick Bamford penalty shout and that did not go our way. "It has been a difficult season and the bottom line is that we have not scored enough goals or won enough games. We need to use this summer to reflect and work out what we need to do to come back. "The chairman is the best in my opinion and I'm sure that talks will be progressing over the next few weeks about the future of the club." Liverpool have finished in the top four of the Premier League for only the second time in the past eight seasons. Philippe Coutinho has had a hand in 20 Premier League goals for Liverpool this season, more than any other player (13 goals, seven assists). Coutinho has scored 15 Premier League goals from outside the area, more than any other player. Middlesbrough are one of three teams to visit Anfield on 10 or more occasions in the Premier League without winning (Sunderland - 16, Middlesbrough - 15 and Bolton - 13). All 17 of Georginio Wijnaldum's Premier League goals have been scored in home games (six at Anfield and 11 at St James' Park). Middlesbrough won just 28 points this season, their worst return in a Premier League season. Match ends, Liverpool 3, Middlesbrough 0. Second Half ends, Liverpool 3, Middlesbrough 0. Attempt saved. Adam Forshaw (Middlesbrough) right footed shot from outside the box is saved in the centre of the goal. Corner, Liverpool. Conceded by Grant Leadbitter. Substitution, Liverpool. Alberto Moreno replaces James Milner. Substitution, Liverpool. Divock Origi replaces Daniel Sturridge. Attempt missed. Adam Forshaw (Middlesbrough) right footed shot from the centre of the box is close, but misses to the right. Assisted by Álvaro Negredo with a through ball. Substitution, Liverpool. Lucas Leiva replaces Roberto Firmino. Attempt saved. Emre Can (Liverpool) right footed shot from the right side of the box is saved in the bottom left corner. Assisted by Adam Lallana. Attempt blocked. Daniel Sturridge (Liverpool) left footed shot from the centre of the box is blocked. Assisted by Roberto Firmino. Substitution, Middlesbrough. Álvaro Negredo replaces Rudy Gestede. Substitution, Middlesbrough. Daniel Ayala replaces Fabio. Attempt missed. Daniel Sturridge (Liverpool) left footed shot from outside the box misses to the left. Assisted by Emre Can. Attempt saved. Adam Lallana (Liverpool) right footed shot from outside the box is saved in the top left corner. Assisted by Georginio Wijnaldum. Attempt missed. Daniel Sturridge (Liverpool) left footed shot from outside the box misses to the right. Assisted by Adam Lallana. Attempt missed. Georginio Wijnaldum (Liverpool) right footed shot from the centre of the box misses to the right. Assisted by Roberto Firmino. Attempt missed. Rudy Gestede (Middlesbrough) header from the centre of the box misses to the right. Assisted by Stewart Downing with a cross following a set piece situation. Rudy Gestede (Middlesbrough) wins a free kick on the right wing. Corner, Liverpool. Conceded by Brad Guzan.